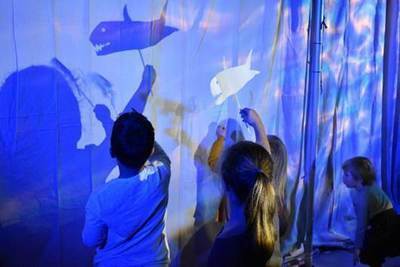 Little Melburnians and their grown-up companions are invited to join in with an interactive sea journey at Arts Centre Melbourne this Autumn. Cerita Anak (Child’s Story), a collaboration of Melbourne’s Polyglot Theatre and Indonesia’s Papermoon Puppet Theatre, is an inspiring story, following the seafaring history of Java, Indonesia, and a true tale of a small boy’s arrival in Australia. Combining puppetry, song, shadow imagery and sound, Cerita Anak (Child’s Story) places children at the heart of the story by inviting the audience, young and old, to be passengers on this adventure on the high seas. Aboard a large boat, participants are rocked and rolled across a strange ocean before they dive to the bottom of the sea, hear stories on the wind and in the currents of the water, and face great danger before coming to safe harbour. The show bustles with all the life of the ocean – from the fish below to the birds above – while evoking the majesty and mystery of the sea itself. The idea of this story was conceived and developed in Lasem, a small fishing village with a remarkable history on the north coast of Java. Lasem was an important port, with many Javanese boat factories in the area. Hundreds of boats are now buried in the Javanese sea following the events of World War II. The history and mythology of this town played a key role in the inspiration of Cerita Anak (Child’s Story) as both companies collaborated with the local community to weave these stories into the work. Empowering its young audience as they navigate the high seas, Cerita Anak is also a timely reflection on the refugee experience and the history of the region. Cerita Anak (Child’s Story) at Arts Centre Melbourne will run for just a short time, from 30 March until 2 April, 2017, in the State Theatre Rehearsal Room as part of Arts Centre Melbourne’s Asia TOPA: Asia Pacific Triennial of Performing Arts.